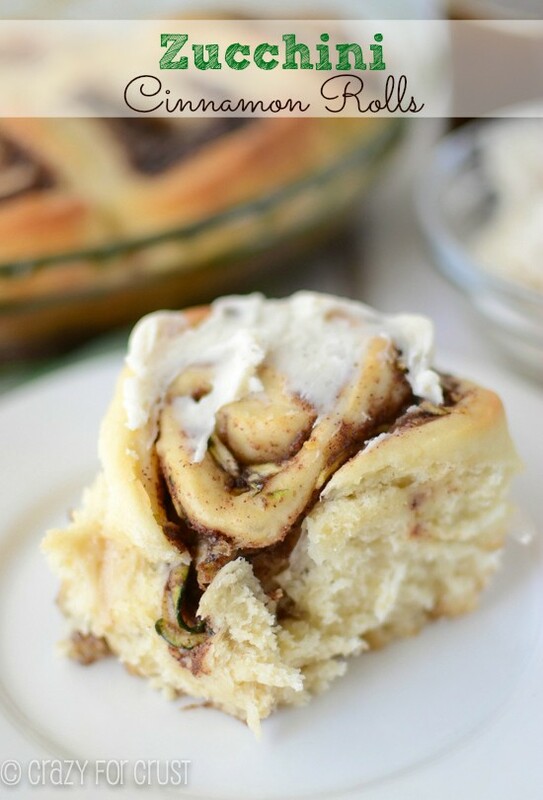 These Zucchini Cinnamon Rolls are fluffy, sweet, and filled with cinnamon and zucchini; a wonderful breakfast for back-to-school or a Sunday morning. Raise your hand if you’ve been sucked into the vortex that is American Girl. You all know my hands are both firmly raised. I’ve talked about Jordan’s obsession here, and here, here, and many more times. I gotta hand it to that company – their marketing team is probably the best one around. I mean, people. They create a two hour commercial for each of their doll-of-the-year girls, package it like a movie, and show it on national television. It’s insane, and genius. Seriously, geniuses these people. I want to hire them to market my blog. Pie Movie, anyone? So anyway, it turns out I know someone who hosts American Girl camps during the summer, and wouldn’t you know it, Saige was the camp this week. I dropped Jordan off this morning and she waved good-bye among a sea of artificial hair and limbs and other 8 year olds. Watch out people: American Girl is going to take over. First, stores and TV shows. Next stop, government. The other thing that is going to take over? Zucchini. Did you know that August 8th is national Sneak Some Zucchini on your Neighbor’s Porch Day? Like ding dong ditch, but with zucchini? And, well. They’re topped with cream cheese icing. There’s nothing better than that, is there? 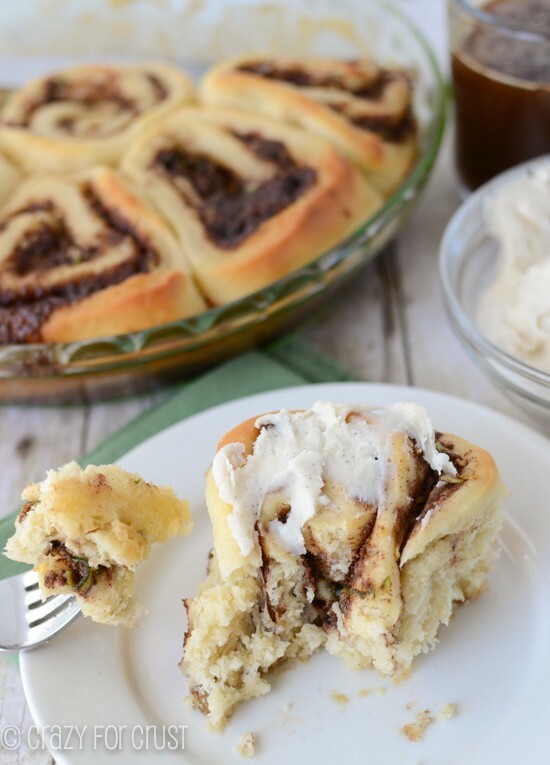 These Zucchini Cinnamon Rolls are perfect for make ahead. You’ll notice in the recipe that I make the dough and the rolls the night before, and then leave them to rise overnight in the refrigerator. That way all you have to do is pop them in the oven when you get up in the morning. 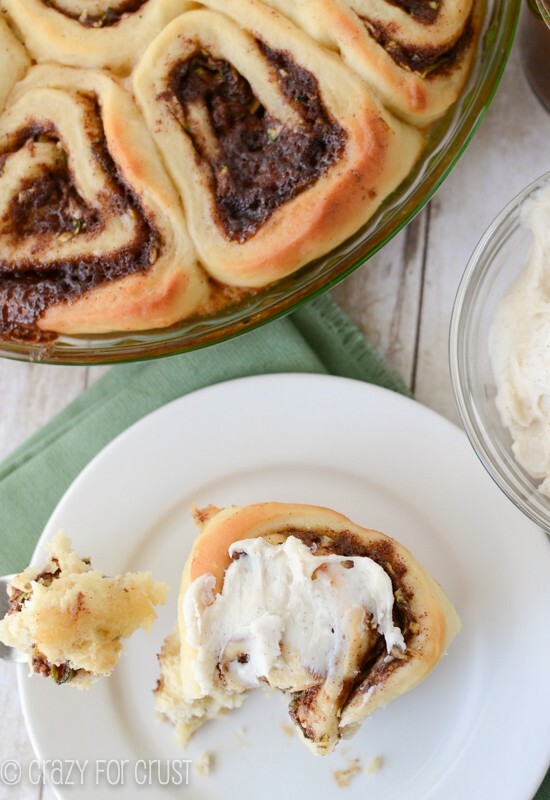 Make these cinnamon rolls on a weekend. Cool completely, and separate the rolls from each other. Place them in individual plastic baggies and freeze. Then, all you have to do is grab one in the morning before school, or when you are jonesing for a cinnamon roll. We did that with these and it was the perfect quick breakfast for Jordan (and me)! You can freeze a little frosting in the baggies too. I froze them without frosting, and added some after reheating. 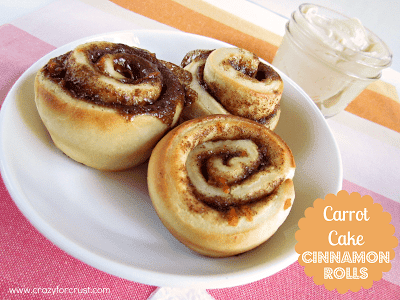 Ugh, now I want a cinnamon roll. Badly. I imagine it’s how Jordan feels after watching an American Girl movie. Or how she’s going to be when I pick her up later today. 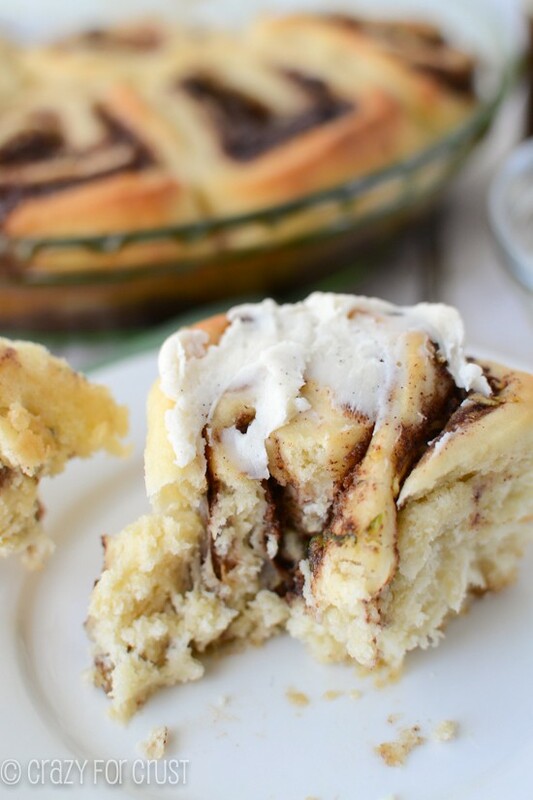 Zucchini Cinnamon Rolls - a fluffy cinnamon roll recipe filled with shredded zucchini! Sneak veggies into breakfast and no one will ever know. Add flour and stir with the paddle attachment just until the mixture starts to stick to the paddle. Then replace the paddle with the dough hook. Continue mixing on low speed until the dough forms a ball in the center of the bowl. Pat your zucchini shreds with paper towels to remove any excess water. 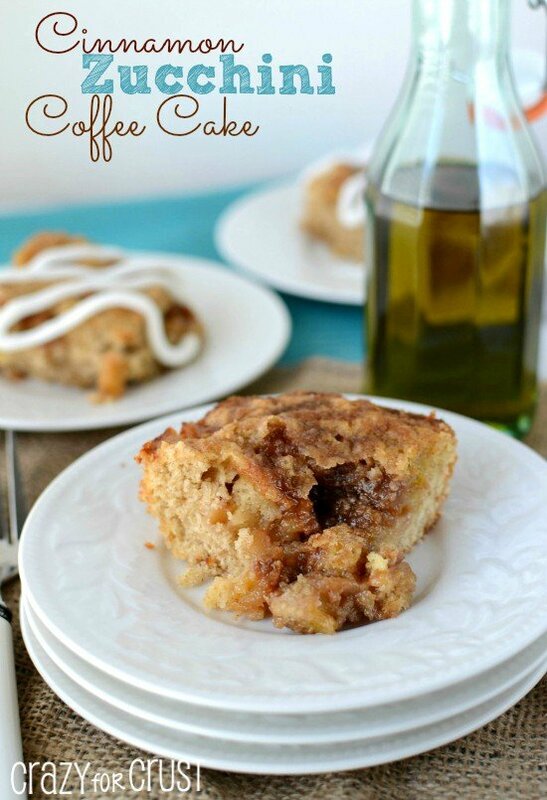 Stir together butter, brown sugar, flour, and cinnamon until it forms a paste. Stir in zucchini. Once the dough is risen, roll it out on a lightly floured surface into a large rectangle, about 12” by 9”. Spread the filling as evenly as possible over the rectangle, making sure to reach to the sides so the outer rolls have enough filling. At this point, you can let them rise for about 30 minutes-1 hour until they are swelling up in the pan and bake as directed. Or you can do what I do: cover with plastic wrap and stick in the refrigerator overnight until ready to bake. When ready to bake, preheat oven to 350 degrees. If the rolls have been in the refrigerator, remove them and let them warm up while the oven is preheating. Remove the plastic wrap and bake for 15-25 minutes, or until they are golden brown. Mix cream cheese and butter with a hand mixer until well blended. Mix in powdered sugar until smooth, stir in vanilla. 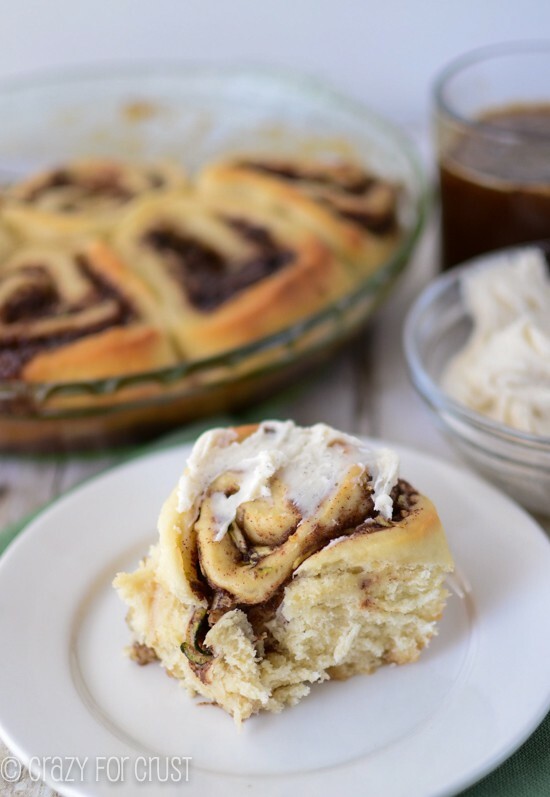 Frost rolls and serve warm. Any clue how non-dairy milk and butter might work for this recipe? I typically use almond milk for my daughter’s dairy allergy and Earth Balance non-dairy butter, but haven’t tried the Earth Balance for baking. Wondering whether the cow’s milk and butter have fats/oils necessary for the cinnamon roll dough?!? I use the Earth Balance vegan butter sticks (they’re not butter) as a sub in baking for dairy-allergic friends with great success. Those should definitely work in the dough, as should almond milk. I’ve been meaning to try doing that! Let me know if it works before I get a chance! 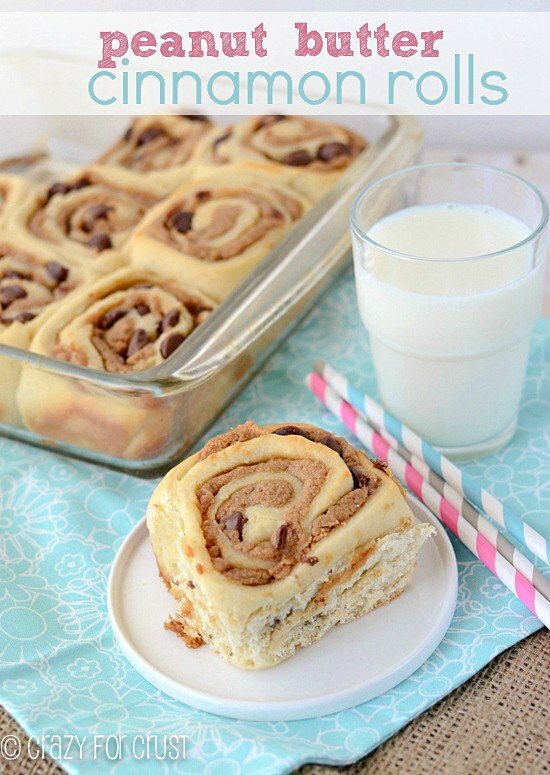 I plan on making these Zucchini Cinnamon Rolls…but do I have to use non-fat milk? We use 1% milk. Please reply. Thanks. You can use any kind of milk! I just always use nonfat, so that’s why I listed it that way.